Canadian Financial DIY: Canadian Government to Stop Paying Cheques! • Fast. The money is guaranteed to be in your bank account on time. That’s especially important if you have arranged automatic withdrawals to pay rent, property taxes, hydro, etc. • Secure. There’s no risk of your payment being delayed, misplaced, lost, stolen, or damaged. • Convenient. The money is in your account when needed even if you’re away from home on a holiday or unable – for any reason – to get to the bank right away. • A timesaver. There’s no need to adjust your schedule (picking up the kids, attending classes, visiting the doctor, etc.) to accommodate banking hours and there’s no need to wait in line for a teller or ATM either." - http://www.veterans.gc.ca/eng/services/resources/direct-deposit for its various payments, though here you still have to print and mail in a paper form. As someone who spends a lot of time out of the country, I've long been a fan of direct deposit and any form of electronic payment. I only wish Canada's banking system had the equivalent of the UK's Faster Payments system, which since 2007 (!) allows anyone to make more or less instantaneous payments and transfers to businesses or individuals. 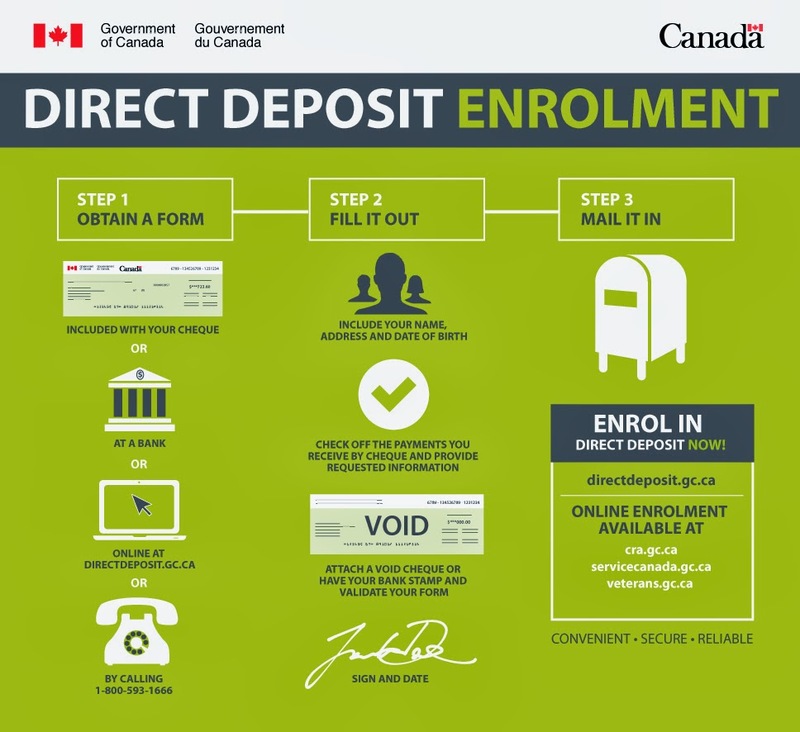 Update: here is graphic from the government's publicity people showing the various other ways to sign up.